100 x Extra Large Size Double Wall Professional Wardrobe Garment Boxes with Hanging Rails, dimensions 20x19x49". 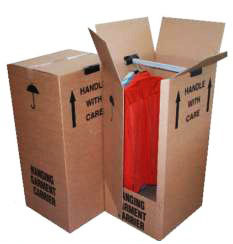 Ideal during removals / moves to store your hand your important clothes and prevent them from getting creased. Also an ideal solution for temporary storage of your clothes while you wait for your wardrobes! All stated dimensions are length x width x height.